Yesterday I spent the afternoon climbing around the majestic Crac des Chevaliers (قلعة الحصن, also spelled Krak des Chevaliers). The iconic hilltop citadel, located several hours northwest of Damascus, towers over the coastal plains north of Lebanon. A fortress of some sort existed on the site for centuries, but the existing castle is the work of an order of Christian knights. 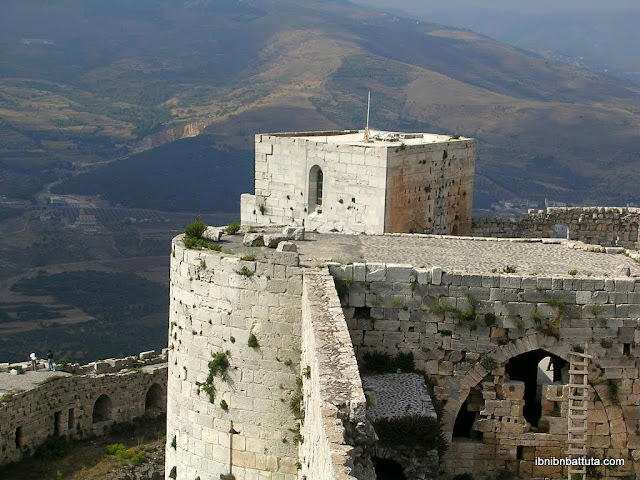 During the Crusades, it was the Knights Hospitaller who conquered the hilltop and refortified it as a base of operations, and for obvious reasons. Looking around from the castle's walls today, the place appears completely impenetrable from all sides. Even the strongest of armies would have been hard-pressed to overtake it, and indeed, both Nur ed-Din's and Salah ed-Din's attempted sieges failed to breach the defenses. dream, complete with turreted towers, flying buttresses, and defensive crenellations running the length of its ramparts. At several points, I found stones in the ramparts decorated with weathered Islamic inscriptions, a remaining testament to the fortress' eventual takeover in the 13th century by the Muslim armies under Sultan Baybars. I and two friends clambered throughout the castle, from its dank, mildewy dungeons, to its stables and banquet hall, to its upper fortifications, from where we surveyed the surrounding plain for miles. The experience would perhaps have been more positive if I hadn't made an unfortunate decision on the bus ride from Damascus. During the trip, the driver's assistant made the rounds up and down the aisle, offering passengers small cupfuls of water, served from a battered plastic gas can. When I arrived in Syria a few weeks ago, I made the conscious decision to start drinking the tap water. (I'll be here in the region for a year, so I might as well encounter all the local bacteria and get the inevitable sickness over with.) But this was perhaps a bit too much, too fast. Despite my grumbling innards, the Crac des Chevaliers was a spectacular destination to explore. In my remaining month and a half here in Syria, I have a long list of other destinations to reach, including Aleppo, Hama, the Mediterranean coast at Tartus and Lattakia, and others. Note: For fellow enthusiasts of Crusader-era history, I cannot recommend highly enough Amin Maalouf's The Crusades Through Arab Eyes, which I'm reading right now and absolutely loving. The Ummayad Mosque: "Matchless and Unequalled"